Danielle Peskowitz Bregoli was born on the 26th March 2003, in Boynton Beach, Florida USA, of Italian and Jewish descent, and better known by her stage name Bhad Bhabie, is a social media personality and internet sensation, probably best recognized as the “Cash Me Outside” girl for her catch phrase “Cash Me Ousside Howbow Dah” in the popular TV show “Dr. Phil”. She is also recognized as a hip hop artist. Danielle Bregoli is the daughter of Barbara Ann Bregoli, and Ira Peskowitz, who works as a Sheriff’s deputy. She was raised by her mother, as her father left them when she was a baby so her childhood was very difficult, and she was a troublemaker who stole money and several times had problems with the law, and had to spend some time at Turn-About Ranch, a school and living program for troubled teenagers. In 2016, Danielle became known in the media, as she was interviewed in the TV show entitled “Dr. Phil”, alongside her mother, in the segment “I Want To Give Up My Car-Stealing, Knife-Wielding, Twerking 13-Year-Old Daughter Who Tried To Frame Me For A Crime”. During that segment, they discuss her bad behavior, including stealing a car from crew member while the episode was being filmed. When she became irritated by the laughing audience, Danielle responded them by saying “Catch me outside – how about that!”, which later became the meme “Cash Me Ousside Howbow Dah”, which earned her a nomination for MTV Movie & TV Awards in the category Trending. Since then, her popularity has only risen, as well as her net worth. In 2017, she appeared once again in the TV show with her therapist, but this time without an audience. During the same year, her catch phrase was mixed by DJ Suede The Remix God, and the single entered such charts as the Streaming Songs, Hot R&B/Hip-Hop Songs and Billboard Hot 100. Apart from her involvement in the entertainment industry as a social media personality, Danielle is also known as a hip hop artist. She released her debut single “These Heaux” in August of 2017, which peaked at No. 77 on the Billboard Hot 100 chart. After that, she signed a recording contract with Atlantic Records and released two more singles – “Hi Bich”, which achieved gold certification by the RIAA – and “Whachu Know”, both of which increased her net worth by a large margin. Most recently, Danielle released her new single entitled “Gucci Flip Flops” in March of 2018, featuring Lil Yachty, which peaked at No. 79 on the US Billboard Hot 100 chart; the music video for the single out came in May of the same year. Furthermore, she earned a Billboard Music Award nomination in the category of Top Rap Female Artist in 2018. Her career started in 2016, and since then she has been an active member of the entertainment industry. So, if you ever wondered how rich Danielle Bregoli is, it has been estimated by authoritative sources that the total size of her net worth is over $1.2 million, accumulated through her successful career as a hip hop artist. Her assets also include a luxury car worth $90,000, as well as a house located in Lake Worth, Florida. 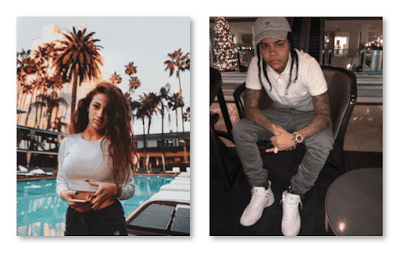 When it comes to speak about her personal life, Danielle Bregoli is in a relationship with rapper Young M.A. Her current residence is in Los Angeles, California. In addition to her career in the entertainment industry, Danielle is an active member across many of the most popular social media sites, including her official Instagram and Twitter accounts. She also launched her own website, on which she announces her forthcoming projects. Speaking about her appearance, Danielle Bregoli is 5ft 3ins (158 cm) tall, and her weight is reputed to be around 115 lbs (52 kg), while her vital statistics are 37-25-35 inches (94-64-89 cm). She has a long red colored hair, and has a lot of tattoos on her body, such as a tiny black heart on her left ring finger, “loyalty” on her right foot, among many others.